Feeding treats can be a fun and rewarding experience for many owners as it’s a great way to bond with your rabbit. However, proper selection and moderation are two essential components to prevent health concerns such as obesity or gastrointestinal distress. 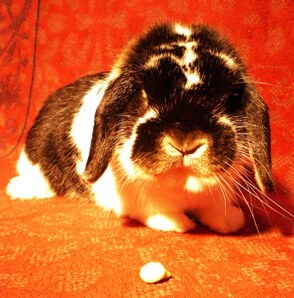 Treats high in fat or sugar can result in loose stools, obesity, and other health concerns in rabbits. Treats should only comprise a small percentage of your rabbit’s daily food intake. The recommended intake is no more than approximately 1 tablespoon per 5 pounds of body weight per day. Human foods should be avoided. Cookies, cereals, and breads are high in fats, starches, and sugars, all of which rabbits cannot metabolize efficiently. Excess fat can be stored in the body, further leading to obesity. Fat can also be stored in the liver and arteries of the rabbit, potentially leading to atherosclerosis or fatty liver disease which can ultimately result in death. The starch and sugars can either be converted to fats or passed to the cecum or large intestine. In the large intestine, starches and sugars are rapidly fermented by the bacteria that reside there. Sudden influx of these nutrients can cause an imbalance in the types of bacteria found in the gastrointestinal tract. This can lead to bacterial overgrowth, gastrointestinal stasis, and bloat. There are a variety of commercial treats available on the market. Select treats very carefully. High-fiber, low-sugar treats are a great place to start. A timothy-based treat will provide increased amounts of fiber, yet in a palatable form. Fruits can be fed as treats but may also contain a large amount of sugars. As with all treats, they should be fed in moderation. Some examples of fruits that make good treats for your rabbit are apples (without the seeds), bananas, pears, blueberries, papayas, and strawberries. In addition to fresh fruit options, freeze-dried fruits with no added sugar also make for great treat options. An all-natural freeze-dried fruit with no artificial colors or preservatives added is always a beneficial selection. Yogurt drops, for example, tend to be higher in sugar and are not an ideal treat choice. Treats with seeds, corn, and other grains tend to be higher in fat and should be limited as well. Vegetables are typically lower in sugar and somewhat higher in fiber, which makes them an ideal treat for your rabbit. Leafy greens are a natural healthy choice for your rabbit as they not only provide a great source of water but also offer a variety of textures to the diet. Choose nutrient-rich vegetables such as romaine, Bibb, and red leaf lettuces. Avoid feeding iceberg lettuce as it contains few nutrients and may cause digestive upset. Limit feeding amounts to no more than 1 teaspoon a day of the following: spinach, collard greens, parsley, kale, dandelion greens, and mustard greens. Again, with any treats or greens, it is important to offer them in moderate amounts. It is recommended to feed your rabbit roughly 1 cup (or an amount equivalent to the size of its head) of healthy greens per day. Remember, the main purpose of providing treats should be to encourage interaction between you and your rabbit. Offering too many treats may subject your rabbit to nutrition-related diseases such as obesity and gastrointestinal distress. However, if fed properly, treats and greens can be a wonderful way to bond with your animal or be used as a training tool with your rabbit.